Will $1 Per Gigabyte NAND Resuscitate Solid State Drives? After two years of inflated prices, NAND flash memory at the end of 2010 is set to return to the key $1 per gigabyte level considered a key threshold to drive adoption of Solid State Drives (SSD), but the cost reduction may come too late to help the struggling SSD market, according to the market research firm iSuppli Corp.
Pricing for 1Gbyte of 3-bit per cell (TLC) NAND flash memory will average $1.20 for the entire fourth quarter and then decline to $1.00 at the end of the year. 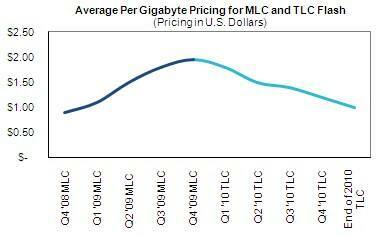 This represents a precipitous drop from the first quarter of 2010, when pricing for TLC averaged $1.80 per gigabyte and 2-bit per cell (MLC) flash was at $2.05, iSuppli memory pricing and forecasts indicate. It also marks the first time NAND flash pricing fell below the $1 threshold since the fourth quarter of 2008, when MLC pricing averaged 90 cents per gigabyte. Now with pricing back to the $1 level, the SSD market is ready to get back on track—or is it? To compete successfully with HDDs, per-gigabyte pricing for NAND flash memory will have to decline to 40 cents by 2012, Yang opined. At such pricing, a 100Gbyte SSD could cost $50, when supporting electronics are added in. This would make solid state storage more appealing in consumer and corporate PCs. The second half of the year is almost certain to see shortages for MLC NAND. However, the complete opposite is the case with TLC as supply is sufficiently ahead of demand. Average capacity for TLC chips in SD (secure digital memory) cards and USB storage devices has stagnated during the past year. When combined with a slowing unit demand due to seasonality, ASPs for TLC chips are falling. Low TLC prices are reaching consumers, which will aid in the purchase of higher-density products. iSuppli predicts the third quarter will see an uptick in growth for TLC NAND flash memory—driven by numerous holidays and back-to-school promotions. To this end, tightly managed inventory levels, along with the closing of some factories, are paving the way for new price competition in the TLC segment, indicating a very real possibility that the magical $1 per gigabyte level might be reached by the end of 2010. That being said, iSuppli believes these lowered component prices, paired with seasonal demand growth in 2010, will lead the overall industry for NAND flash memory to reach a record $5 billion in revenue in the third quarter.